Yeast surface display is an alternative method for isolating and engineering antibody fragments (Fab, scFv) from immune and non-immune libraries, and has been used to isolate recombinant antibodies with binding specificity to variety of proteins, peptides, small molecules and T cell receptors. In this system, yeast display libraries are produced by cloning the pool of genes coding for antibody fragments into vectors that can be transformed into the yeast. The transformed antibody genes are displayed on the surface of yeast Saccharomyces cerevisiae via fusion to an α-agglutinin yeast adhesion receptor, which is located in the yeast cell wall. 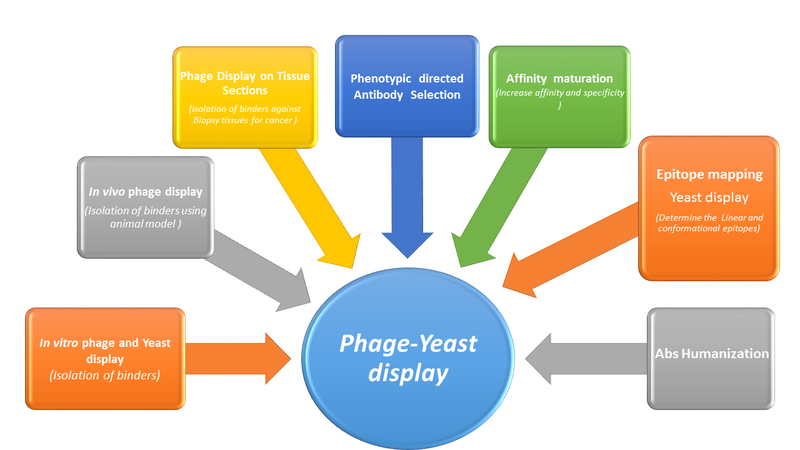 Like phage display, yeast display provides a direct connection between genotype and phenotype. A plasmid containing the gene of interest is contained within yeast cells and the encoded antibody is expressed on the surface. The display level of each yeast cell is variable, with each cell displaying 1 x 104 to 1 x 105 copies of the scFv. Screening of antibody variation of surface expression and avidity can be quantified using fluorescence activated cell sorting (FACS), which measures both the strength of antigen binding and amount of antibody expression on the yeast cell surface using separate tags on the antibody and antigen. FACS binding assays provide a much more quantitative way of assessing high binding affinity and selectivity for the antigens and offer the ability to accurately control selection parameters (binding population percentage, signal normalization, and desired binding affinities) by flow cytometry.. There are usually 3-5 rounds of enrichment of target antigen-binding clones . The antibody expressed by a single yeast colony is evaluated for specificity and reproducibility. If the antibody has the required functionality, the antibody gene is sequenced as part of antibody validation.